Part of nurturing with touch is knowing when not to touch. As a kid, I used to pee my pants during tickle fights. My family didn’t mean to embarrass me, but they didn’t understand. I desperately wanted to participate in the family fun, but it was humiliating to lose control of my body in the course of doing so. And I wasn’t assertive enough to speak up about my discomfort. For example, we play “tickle chase” with our toddler. First, I announce, “I’m gonna TICKLE you!” Then I give him a head start and get on all fours and chase him. He giggles a ton and usually lets me catch him after a while. If he lets me catch him, I tickle him; if not, we just keep chasing, or he can go play with toys or ask to be picked up. By applying the three steps to our tickling game, my husband and I end up tickling lots, but only when our son wants to be tickled. I apply these steps to kissing too. I sometimes announce that I’m going to kiss him, but more often I make a ridiculous “mmm” sound. Then I pucker up my lips dramatically and lean in. 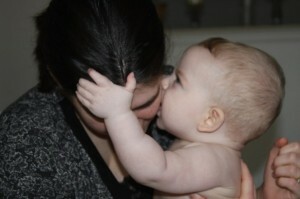 I go slowly enough that my son has time to turn away if he doesn’t want to be kissed, in which case I say, “No kissies? Okay!,” and we go play something else. If he wants to be kissed, he opens his mouth wide, leans in, and/or says “mmmm” right back at me. He gets lots of kisses, and I like them all the better for knowing they’re wanted. By following these three steps, you give your baby/child time to process what you’re about to do and then express their reaction. Every kid is different, but you’ll quickly learn which reactions (like shoving his foot into my hand when he wants his toes tickled!) means your little one wants more physical interaction, and when they’ve had enough for now. It can be disappointing at times that my son doesn’t want to be kissed or tickled every time I offer. But I’m glad that I’m respecting his wishes and his space. I hope that it helps lay the foundation for a lifetime of respecting his own body and the bodies of those around him, and of knowing that his mom and dad think his needs and wants are important. Maman A Droit is a conservative Catholic stay-at-home mom in the Midwest with a breastfeeding, co-sleeping son (born July 2009) and a hubby who’s been known to babywear on occasion. She’s also fond of printing off applicable state laws on breastfeeding in public to stash in her diaper bag whenever she travels. She blogs at Maman A Droit. Yup. I do this growly thing or I say “besito mami” (kiss mama) and then I either kiss her or wait for her to turn away. Once in a while I can’t resist and I just smooch her but I try to let her know that I know I am doing it without asking her permission. I also don’t like to hold her down when I am changing her. She’s only 8 months old, but it’s still her body! My daughter hasn’t wanted to be hugged or kissed in over 6 months. It’s hard not to take it personally, or push the issue sometimes, but we would rather she felt fully in control of her body and how she is touched then that we get what we want. Thank you for this lovely post. I really like how you approach the issue with your child. Holy cow, I love this! It’s so easy to assume that our children will enjoy what we enjoy. We like being kissed, snuggled, and tickled – these are nice thing to do, so why think twice about doing them to our children? As you so beautifully explain, however, even if our children do like these things, they don’t necessarily want them all the time, and they deserve to feel considered and respected! I also remember peeing my pants from getting tickled… I think it is so important to let our children set their boundaries and for us to respond to that rather than charging in. One of my favorite books is Your Amazing Newborn, which talks a lot about how even infants communicate with us about their limits (one of the most obvious ways being that they break their gaze from us). 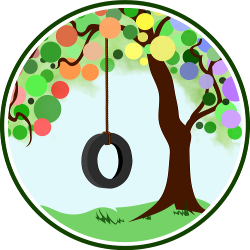 It’s a wonderful gift you’re giving your child — attunement and respect!